That's me. I'm a cheese snob. Not the kind you're probably thinking of though. I'm the kind of cheese snob who thinks she's too good for those expensive, fancy, hard-to-pronounce cheeses. I enjoy a little feta and goat cheese, but beyond that, I prefer the basics- mozzarella, Parmesan, cheddar, monterey jack, even a little Swiss. I know how those cheeses taste. I know how to use them. I know that when I shed out precious moolah to buy them, I won't be disappointed because I know what to expect and they deliver. Some of you are probably moaning in agony, imagining a world without fancy cheeses and want to traipse over here and shake me and tell me what I've been missing. Well, on a very small scale, I may have already learned that lesson. I'm forever looking for new recipes to try, but for me this is a bit tricky because I don't grocery shop like most folks do. I do most of my shopping in my pantry and freezer, so if a recipe doesn't call for what I have (produce and meat-wise), I won't make it. 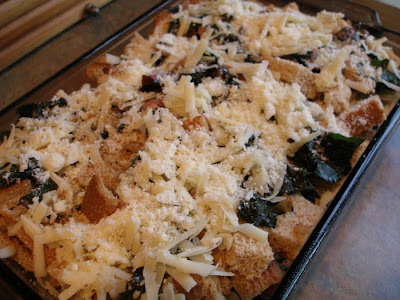 I was thrilled to find a recipe over at Smitten Kitchen that I hardly had to adapt (I just substituted Swiss chard for the spinach and whole wheat bread crusts for the French bread) to fit what I had. Except for one main ingredient. Gruyere cheese. Oh, dear. I had never used Gruyere before. Nope, never. I scoped the cheese section out at our local grocery store during my last trip and found it sitting there, calling out to me, "I'm here! The recipe calls for me. Get over your cheese-snobby self and buy me!" So, I did. 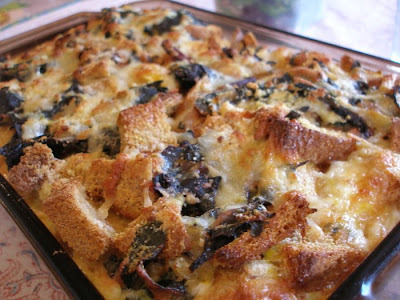 Then I went home and made Deb's Spinach and Cheese Strata. Well, hmmm...I think I'm a cheese snob, too! I've never had Gruyere either. But that's going to change real soon here...! As a self professed cheese obsessour I do want to e-shake you. Stilton, Havarti, Brie oh my! And Gouda is sooo good-a. Once the pears start coming I highly recommend a snack of Stilton (a blue cheese) and pear and some crackers. Oh please, oh please branch out and taste what cheesy wonderfulness is out there waiting for you. So glad you're coming 'round! 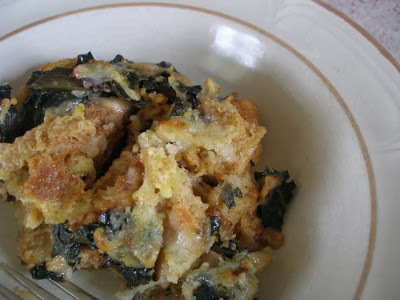 Have you ever tried the chard-sweet potato gratin? It has Gruyere in it. Need I say more? We are cheese snobs, on the other end. We love it so much that I dared Chris to give up cheese for lent. :) I've often used swiss in recipes that call for guyere and it usually works fine. We love brie on crackers and apple slices. Once I even put it on filet mignon. Hope I didn't just give you a heart attack :)It's one of those finer things in life we've decided to indulge in. Gruyere is a specific type of cheese in the Swiss family, thus the reason you can pretty safely use one in exchange for the other without much change in the recipe. But it's kind of like saying that the 'stuff' in the green can is Parmesan cheese. Sure, it technically is, but you lose a lot of quality. Branch out--try new cheeses! If you are close to a Whole Foods, they will let you try out any of their cheeses on display. Great way to decide what kinds you like. And with the better cheese, yes they are more expensive, but a little goes a long way. No additives and preservatives either--unlike that sad green can! Emmentaler! It's in the Swiss family too and it's so so so so good. I could not live without cheese (so I should maybe try a cheese fast the same way you are doing sugar!). I get cravings for cheese.